More Photos Of This Vacation Rental Below! Beautiful mountain views and the Methow valley below. summer is coming and there are beautiful places to visit during your stay. Spectacular mountain/river view home! 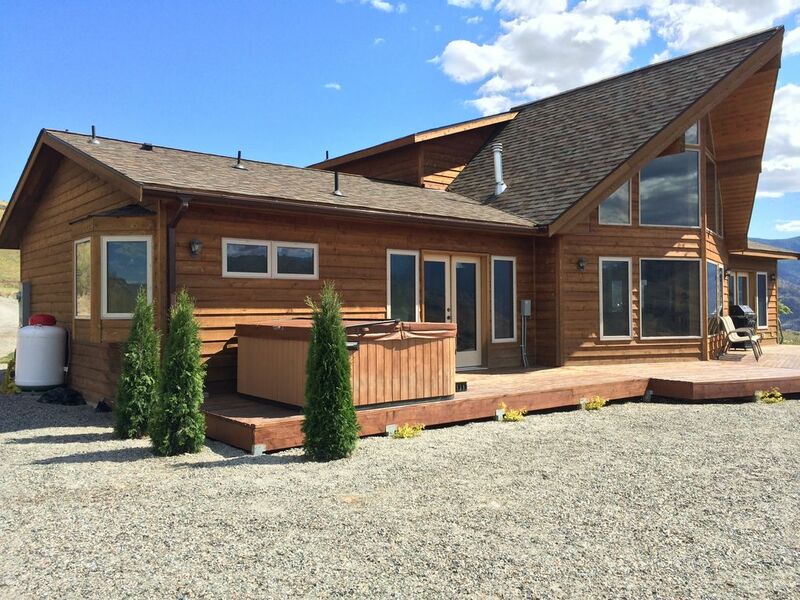 This 3 bedroom/loft Lindal cedar home is situated in the peaceful Methow Valley. With commanding views of the Chelan Saw tooth Ridge and the Methow River down in the valley. A fantastic getaway for the whole family and even your pets will love the outdoor freedom. Located just about exactly between Lake Chelan and Twisp. 35 minutes each way and you are there. Add 10 min to that and you are in Winthrop. A short drive to the Methow River and minutes to Alta Lake, the Alta Lake Golf Course and the Colombia River. This allows quite the options for daily activities. For winter, there are several snow parks located in the Methow Valley within a reasonable distance from this gorgeous home. This comfortable home is equipped with all you need for a comfortable stay. including a 6-8 person hot tub. A full kitchen with accommodations for all your culinary needs. Sleeps 8 (and 9 if using the hide-a-bed) The master bedroom has its own private bath with a whirlpool tub and a separate oversize shower. Wake up and see the mountain view from your bed and then relax in the whirlpool tub. Enjoy the peaceful nature of mountain acreage. Far up the mountain in a great way. There were some bees, but can’t really expect different on the top of a mountain! Really nice cabin! The pictures do not do this property justice. The views of this home are breath taking and it is kind of cool driving the dirt roads to get to this place. It’s hard to find at night. The guy that I worked with during the whole rental process was fantastic and communicated well. The only reason I gave 4 stars instead of 5 was because the kitchen is very out dated with some much needed TLC. I would definitely rent this place again just for those views. We were very happy with out stay and glad we found this place. We often go to places that are in close proximity of other homes, but glad we tried something different. This is truly a mountain home with the most gorgeous views looking at the Eastern slope of the cascades. We truly felt on top of the world, but yet still within reasonable distance to Chelan. The home was great and had everything we needed for a big family. Wasps. There were about 20 wasps in the house when we arrived, and hundreds more were swarming around the outside of the house and the hot tub. The few traps around the house were obviously not enough to curb the problem, so we had to add an hour to our trip to get some spray to make the place safe. We have T-mobile and had no service at all at the house. There is no phone inside the house, so in an emergency, it would be really difficult to get help. The spring matttesses in the loft upstairs are so worn out that they sag, making them extremely uncomfortable, especially if two people have to share the bed. Overall, a few updates in the decor would be nice. I stayed here with my family of four and my mom and it was great. The location is absolutely stunning and the views from the house and the property are pretty difficult to beat. As for the house, it was very well maintained and had all of the necessities for a comfortable stay. They owner is really great to work with and was prompt in responding. The only reason I didn't give it five stars is that 1. it is difficult to get to the house and it is mostly dirt roads that don't have great signage. Once we found it it was great, but the first time was tricky and I definitely wouldn't want to find it at night. 2. There wasn't WiFi, and as a millennial with children it was a bit difficult, especially since I needed to send some emails out. Thankfully the cell signal is strong there. 3. There aren't any shades on the windows with a view (which is all the rooms except one) and there's no real option to sleep in if you want to. The sun wakes you right up, although it is gorgeous to wake up to. Outside of these minor details it's a wonderful place. We would definitely go back and we would recommend it any day.